I've been using a rr track for an anvil, while looking for a "proper" anvil. Today I was at the local steel supplier and just asked about some heavy chunks of steel, he pointed me to the back shed where he said there was some big chunks of d2 that they had picked up along the way somehow. There was probably 10 tons of the stuff there im various shapes, the biggest chunk was about 18x12x8 (didn't have a tape measure) I could barely roll the thing up on edge. Now I know that it would be heavy enough, but would d2 make a good anvil? He didn't give me a price but said that his boss would give me a good deal on it, but before I pay anything for it I want to know if it would give me any problems. Yes. D2 is a VERY tough steel, highly abrasion resistant, and darned near stainless due to chromium content. The only question would be how hard is it in its present state? You don't want it too hard is the thing. There's probably no such thing as a anvil being too heavy but you could do just as well with a smaller piece. I got a block of H13(?) 8.25X7.25X4.25 that weighs in at 87lbs and it really moves steel. If you get that piece, mount it so that it's 18" high to keep as much of the mass as possible under your work. Make sure that you round the edges and corners a bit. 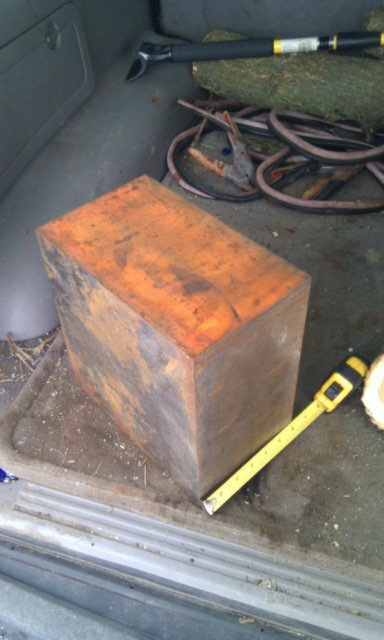 That block of mine out works a 110lb European style anvil by a wide margin even though it rebounds less. A good block like you're looking at will make you want to turn your railroad track anvil into a boat anchor. if u get a good price on it wouldnt that stuff make some great knives? Thanks guys! I'm assuming that it's annealed as it looks like it's been saw cut. They really don't know more than that it's D2 steel, it came from a local stamping plant that closed it's doors, they used it for the die's. Will it work well in it's annealed state or should it be heat treated? A file should be able to tell me approximately how hard it is, correct? If it will make a good knife I'll pick up some smaller pieces of it as well. There was all kinds of it there, I'm gonna find out how much it is before I decide on the huge piece, Doug thanks for the dimensions of a block that will work well. Interests:Swordmaking. Kendo, Iaido, Housebuilding , Guitar, Fiddle and Grandkids. I tried that once with block of D2 much smaller than the one Zeb is looking at. Cheaper and way easier to buy d2 knife stock rather than paying for bandsaw blades and the time to do it. You should not buy it, except to send to me . I've got a 5 x 6.5 x 33 piece of as-found 4140 that I use and it's great, better in fact than my Fisher for knife making. Give it a rap with a hammer, to check for rebound and to check on how it marks. Unless it has no rebound at all and takes marks really easily (or chips), I'd go for it. Mount it with the longest axis under the hammer and figure a way to attach it to a block or stand and you'll probably be very happy with it. D2 is tough stuff, tough to work too. You might want to check out what the HT is like before you go all in on a bunch of stock. I also wouldn't plan on forging it. It can probably be done, but it's an air hardening steel and best for stock removal. It's an excellent blade steel when properly heat treated, very tough and very stain resistant. Sounds like a potential great anvil too. Even dead soft annealed it will make fine anvil as long as you do hot work on it. If it is a good deal, get it, and use it. You won't regret it. For bladesmithing, a bit rectangular block is great. I use the horn doing some other stuff, but rarely (almost never) miss it making blades. I use a big block of steel that came with my power hammer as a saddle die, the face is 5" X 13" and it works great. didnt know it was that tough to work. sounds like good anvil metal. That railroad track anvil a boat anchor yet? Ha, it's well on it's way Doug, the big chunk of D2 has been getting some use in the past couple days. I'm trying to talk a friend of mine to get into bladesmithing, but he's on the fence, I may give him the RR track and an old brake drum forge I have that I don't use. It would be a cheap way to get your feet wet, but I'll include some ear plugs in the deal I never realized how loud that dang track was until I started using something proper. Thanks again for all the advice! Well a European type anvil can ring pretty loud too. The thud of the steel block doesn't carry as far as the ring of the anvil. Nice block regardless. The good thing about leaving it as is... you can resurface it as many times as you like and you have many faces to use before you even have to worry about it. Looks like a life time anvil to me... good score. I am a toolmaker and we use d2 for making progressive dies. Normally we are talking cross sections of no more than 2 inches. We just put in in a stainless bag (to prevent scale) and put it in the furnace when the furnace is cold and have it heat it to 1850 F and then hold it at 1 hour per inch of the thinnest cross section. We then remove it from the oven and let it air cool and temper it at 400 F. This usually achieves 55-60 rockwell. I have never had any problems with this steel. Hi Zeb, I know this post is kind of Old, but I was wondering if you can please let me know which local steel supplier you went to to get this piece. I live in Michigan and I am hoping this place is near by for me.